Welcome to Midas Explorer - powerful, interactive tools for MIDAS analysis! Midas Explorer offers powerful tools for technical analysis with MIDAS, based on Paul Levine's innovative approach. MIDAS provides dynamic support and resistance curves, which can be easily drawn and managed using any time frame for swing traders and day traders. We offer tools including MIDAS S/R and TopFinder for analyzing market trend. Standard MIDAS suppport and resistance curves provide powerful signals for trend followers, while MIDAS TopFinder and BottomFinder curves closely indicate price action for accelerated trends. Learn more about Midas Touch, our interactive tool to create MIDAS S/R curves. Check out Midas Fit to explore chart trends with TopFinder and BottomFinder curves. 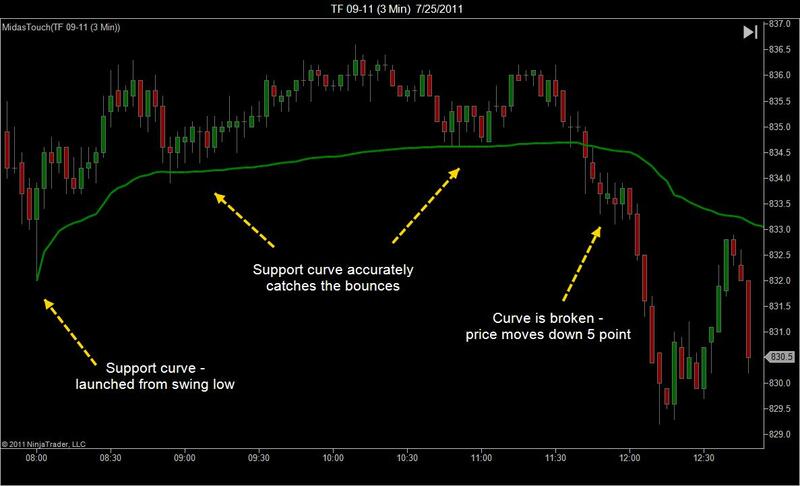 In the sample below, TF futures is shown on a 3 minute chart with a MIDAS support curve. This is normal MIDAS behavior - capturing several pullbacks, and when finally crossed, pointing to a strong downturn. Even after the support line was broken, price returned to retest it as resistance.